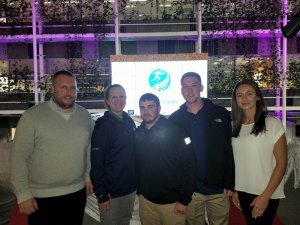 Representatives of the Marshall University Department of Biomechanics traveled to Auckland, New Zealand, Sept. 10-14 to attend the 36th International Conference on Biomechanics in Sports. Three graduate students and two faculty members within the department each had papers accepted for presentation at the conference, according to Dr. Suzanne Konz, director of the university’s biomechanics program. · Mahalie Hargis, 23, of Hamlin, West Virginia, who led a poster presentation titled “Examining the Reliability and Validity of the Fitbit Charge 2™ Technology on Heart Rate During Treadmill Exercise.” She also presented on the reliability and validity of the Fitbit Charge 2™ Technology on step count during treadmill exercise. Ebert said the International Society of Biomechanics in Sports conference was truly an eye-opening experience.